Ever wondered how New Delhi came into being? Who were the architects who created some of the capital city’s imposing buildings? 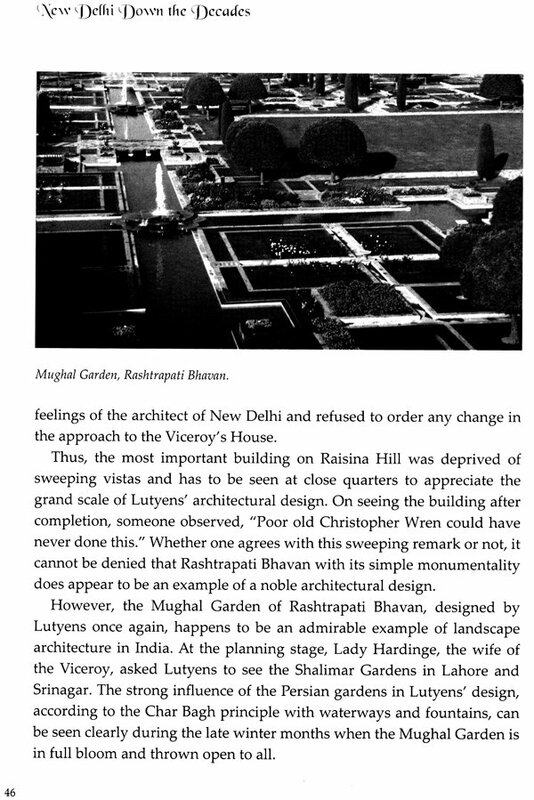 New Delhi Down the Decades takes the reader through the days when iconic personalities such as Sir Edwon Lutyens and Sir Herbert Baker were working on a unique style of architecture that makes New Delhi special. New, Delhi, or rather Lutyens’ Delhi as it is now known, was still young—just over ten years of age—when Dhruva N. Chaudhuri came to the city with his parents and brothers. He had his first look at the capital city of India in June 1942 and has watched I grow in the as seven decades, from a quite garden city into a giant metropolis. Dhruva N. Chaudhuri is a renowned photojournalist. He began his career with The Statesman in Delhi and Kolkata at the age of eighteen. He has worked with leading deilies and magazines in India, including The illustrated Weekly of India. His photographs have been published in several foreign newspapers and magazines. The Millennium Book on New Delhi showcased over forty photographs by him. His books, Delhi: Light, Shades, Shadows and Nirad C. Chaudhuri: Many Shades, Many Frames, both published by Niyogi Books, have been very well received. He is reputed for his knowledge of architecture and understanding of nature. He is deeply interested in wildlife photography as well. In Nirad Chaudhuri's Thy Hand, Great Anarch! we read a Calcutta denizen's impressions of the grandeur and the vastnesses of a very young New Delhi, its trees only a few feet high, its bungalows deserted for half the year. It has been left to one of his sons, the talented photographer Dhruva, to take the story further, to describe how the new capital coped with the flood of immigrants in 1947-48, and changed from being the sparsely-populated, slow-moving five-month capital of British India, into the all-weather capital of India. Dhruva Chaudhuri needs no introduction - he, with Maheshwar Dayal, Imdad Sabri, Akhilesh Mittal and R.Y. Smith, constitutes that little group that has done a service to Delhi's inhabitants by interpreting their city. He has an advantage over the others in that he wields not only a pen, but a camera. In the last few years many illustrated books have been published on the Durbar of 1911 and on the construction of the monumental buildings of New Delhi. But this book goes well beyond the other-here are selections from a priceless archive of half-a-century, photographs with a quality of beauty because of the play of light and shade, and a quality of charm because of the author's sense of irony and quirky sense of humour. His razor-sharp memory makes Dhruva Chaudhuri an archive in himself. After recounting the oft-told tale of the choice of architects and the arguments about site and style, he becomes part of the story. From 1952 (the date of the cover photograph) we embark on a leisurely journey through half-a-century. 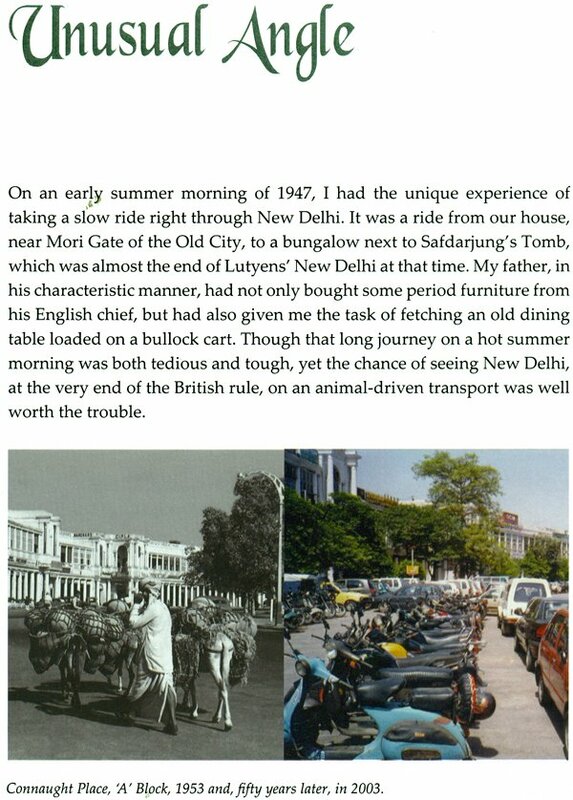 It takes a lot of imagination today to visualise young Dhruva travelling by bullock cart from Kashmiri Gate to Teen Murti to collect the furniture being sold by a British civil servant; on the journey home he sits under the dining table to escape the mid-day heat! He has conversations with Walter George, who had been part of Lutyens' team and stayed on to design institutional buildings in the modern style which he thought totally appropriate for the capital of India. In those glorious days when the word 'security' was not heard, and the Delhi Police were not with us or for us always, Dhruva and his camera wandered around without let or hindrance, recording the Prime Minister's House, Chanakyapuri, and Broadcasting House (the imposing new avatar of the radio station in the Civil Lines where his father had worked). He photographs the undulating area around Purana Qila which was being redesigned into Sundar Nagar and the Zoo, and the construction of Krishi Bhavan and Udyog Bhavan, shabby cousins to Baker's Secretariat buildings. He is struck by the architecture of the churches and gurdwaras in New Delhi, and equally by the monuments of Kotla Mubarakpur before it was engulfed by South Extension One. When Delhi began to go vertical, he saw opportunity- he could now capture the aerial views which earlier had required a low-flying aeroplane. With their unfailing knack for bad timing, the British had built an expensive imperial capital precisely in those years when everyone could see that the days of the empire were numbered. But, as Mahesh Buch pointed out, the imperial city was also a democratic one. It could be comfortably navigated by a pedestrian, even after the few dozen cars in the city had multiplied to tens of thousands. And leading the pedestrians is Dhruva Chaudhuri, camera slung round his neck, urging us to make time to "stand and stare". So switch on the lamp, settle down in your favourite chair, and read on.